Sri Lanka captain Dinesh Chandimal has pleaded not guilty to breaching Article 2.2.9 of the International Cricket Council’s code of conduct and a hearing will be held following the conclusion of the ongoing second Test against the West Indies. 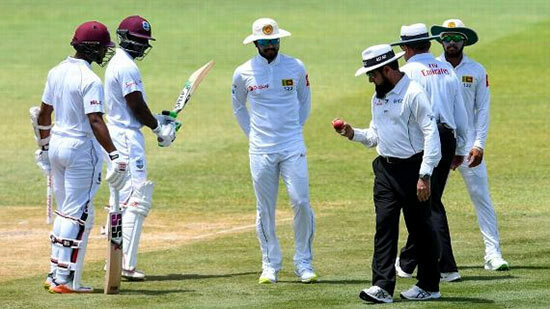 On-field umpires Aleem Dar and Ian Gould, and third umpire Richard Kettleborough had charged Chandimal after the third day’s play on Saturday for changing the condition of the ball in breach of clause 41.3 of the ICC Standard Test Match, ODI and T20I Playing Conditions. “The officials laid the charge after television footage from the final session’s play on Friday appeared to show the Sri Lanka captain taking sweets out from his left pocket and putting these in his mouth, before applying the artificial substance to the ball which the umpires viewed as an attempt to change its condition,” the ICC said in a statement. Video evidence will be used during the hearing held by match referee Javagal Srinath which will also be attended by the match officials as well as members of the Sri Lanka team management. “All level 2 breaches carry an imposition of a fine between 50 per cent to 100 percent of the applicable match fee and/or up to two suspension points, and three or four demerit points,” the statement added. The game’s global governing body announced the news on Sunday, saying more details would follow. “Sri Lanka captain Dinesh Chandimal has been charged for breaching Level 2.2.9 of the ICC Code of Conduct. More details to follow in due course,” the ICC said on its official Twitter account. Sri Lanka Cricket (SLC) stoutly defended the team, saying it would defend any “unwarranted allegation” against any player. “The team management has informed us that Sri Lankan players have not engaged in any wrong doing during the ongoing (2nd) Test match played between Sri Lanka and West Indies,” the SLC said in a statement. “The team on the third day of the match protested a decision taken by the umpires citing ‘changing the condition of the ball’,” the statement added. Article 2.2.9 of the ICC’s code of conduct relates to changing the condition of the ball in breach of clause 41.3 of the ICC Standard Test Match, ODI and T20I playing conditions. It prohibits actions such as deliberately throwing the ball into the ground for the purpose of roughening it up, applying any artificial substance to the ball and applying any non-artificial substance for any purpose other than to polish the ball. Lifting or otherwise interfering with any of the seams of the ball and scratching the surface of the ball with finger or thumb nails or any implement are also prohibited under this clause. The on-field umpires had expressed concern over the condition of the ball on the second day of the Test and match referee Srinath had awarded five runs to the West Indies on the morning of the third day. The Sri Lanka players had taken to the field two hours after the scheduled start of play on the third day as a mark of protest.